Now, I know it’s been hard to remember I actually I have an internship in New York because I haven’t been writing anything about it. But I have to keep in mind the reason why I’m here. 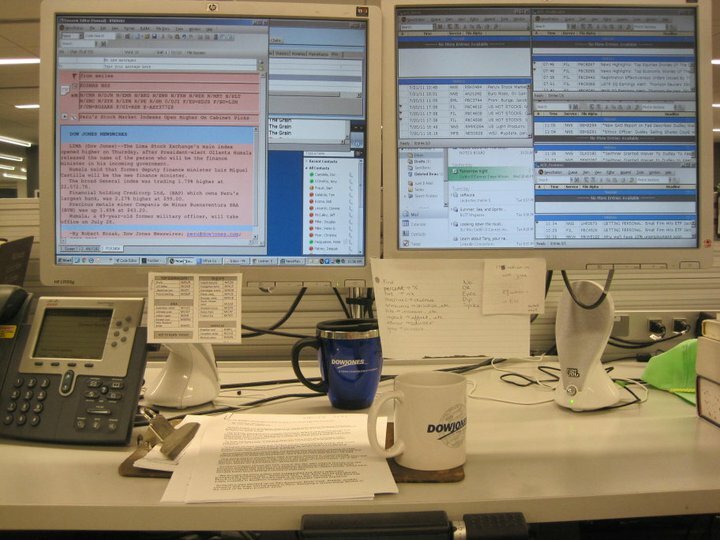 I thought I’d run you through a day in the life of a Dow Jones intern. Once I get to the fourth floor of the News Corporation building, I take a seat at my desk. Having my own desk makes me feel important. 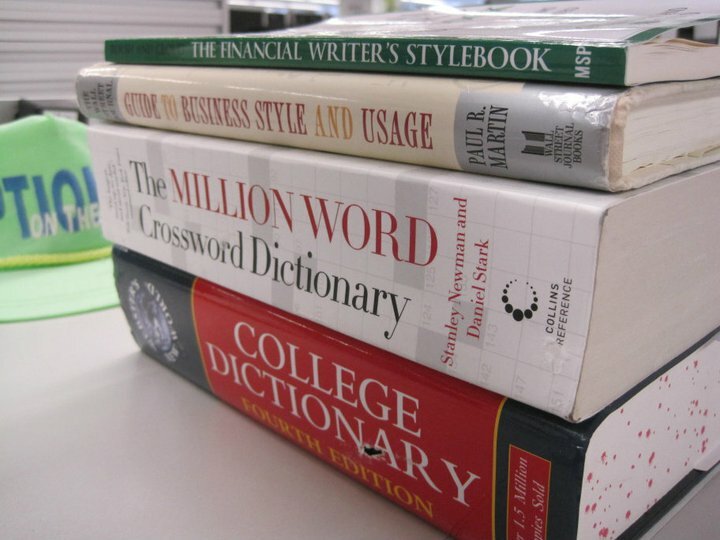 I have my Webster’s dictionary, my million-word dictionary, The Financial Writer’s Stylebook and a borrowed copy of The Wall Street Journal style guide stacked to my right. 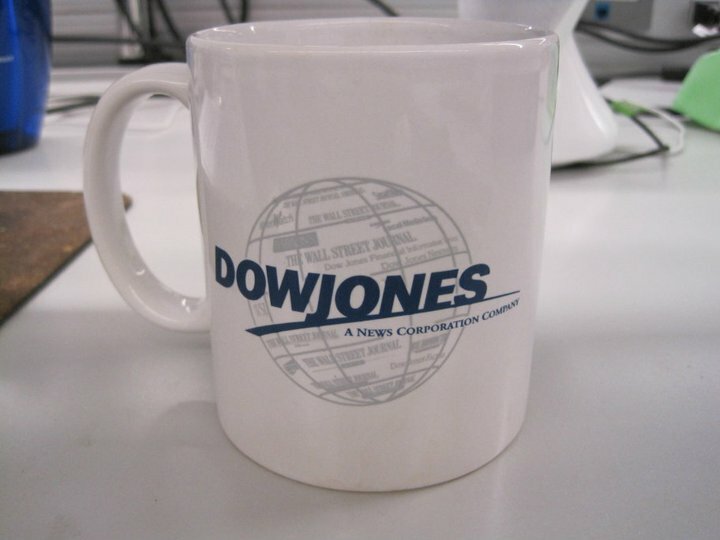 There’s a Dow Jones mug in front of me. Today, it’s filled with water, but on most days I seek caffeine in the form of English Breakfast tea. I have my own cool phone with my very own extension. 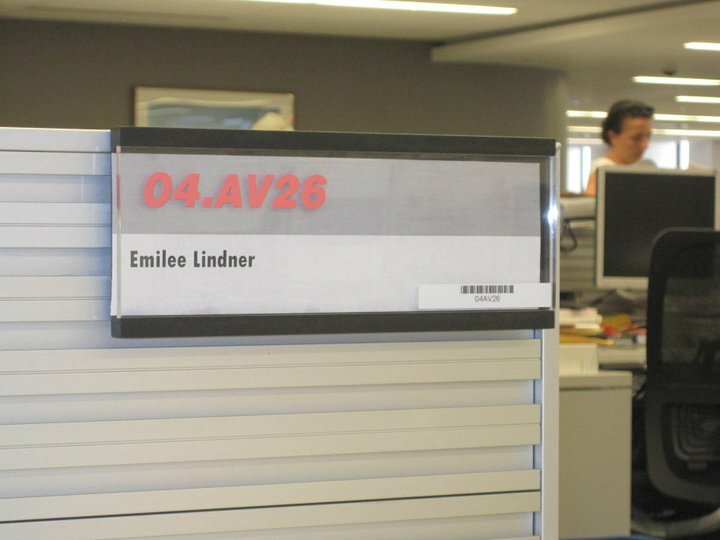 “Hello, this is Emilee.” Sometimes, I have to make calls to reporters if something in their copy isn’t clear. I called Brazil once. Sawweeet! I set up Newsmanager (our story-filing system) on my two-monitor computer, flick on my available “light” on Office Communicator and wait for a story to come into my queue. 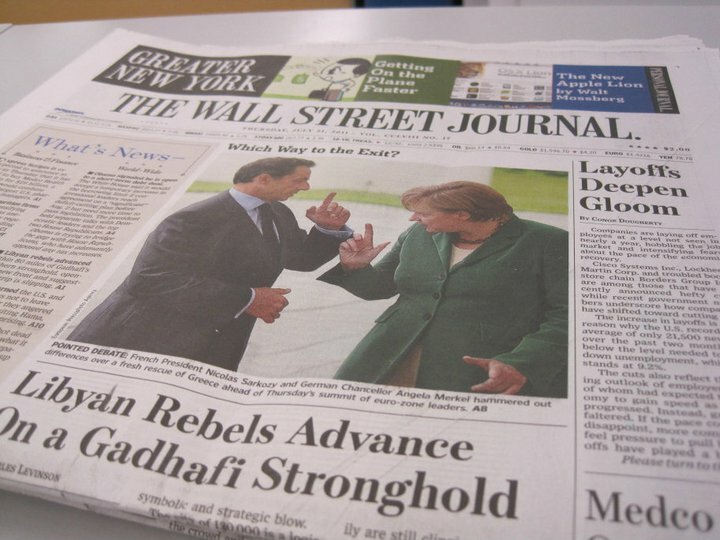 While I wait, I read WSJ.com. Once I get a story, I check for grammar, spelling, ticker symbols, names and stock quotes. I replace words that are overused, such as “eyes,” “OKs,” “dip” and “spike” as verbs. I have to add and omit coding used on the wires, which really aren’t wires anymore. Copy editors have to make sure the story gets to the correct subscriber on the proper wire. We have to edit the subject, industry, company and monetary codes. They send me a lot of stories about stock prices in various different exchanges, commodity news and bankruptcy reviews. At first, I had no idea about any of these subjects, but I’m learning. When I’m done reading a story, I send it to Bob, my mentor. We read it together, and he shows me stuff I should’ve changed or stuff I changed incorrectly. When the story is to his standards, he publishes it to the wires. I go back to my seat and it starts again. Although I’m learning a bunch, this process gets repetitive. This week, I’ve been editing Focus, which sort of breaks up the day. Focus is a feature ran on Tuesday, Wednesday and Thursday. I’ve also edited Tip Sheet. A tip sheet is written by a Newswires reporter, who interviews a fund manager and others about a fund’s performance and its choice stocks. I have to update info and edit for clarity and accuracy. My coworkers are really helpful. I’m always asking questions, maybe too often, and they always help me. They often bounce questions off each other anyway, such as the wording of a headline or which wire to send a story to. I take an hour lunch break at 1:30 p.m. I usually go down to the NewsCafe, which deserves a separate post. I work 10 to 6, and I’m pretty excited to get outside every night. I’m in my ninth week of my internship. Even though you talk to me about work almost every day, I never knew this many details. The pictures were a great touch!